When you're on your own and attempting to cook for yourself, it can be a challenge. In order to become a kitchen pro, you need to learn how to navigate the kitchen and you need a repertoire of easy healthy recipes. Here at FaveHealthyRecipes, we're here to help. We've compiled a list of 14 Easy Dinner Recipes that will get you started on the right foot. All of these recipes use common ingredients that are easy-to-find in your grocery store or you may already have them in your kitchen cabinets. There's no need to order takeout or run through the drive-thru because with these easy dinner recipes, you'll be cooking like a pro in no time at all. We recommend that you cook these recipes for your friends and family; they don't need to know how easy these recipes are to make! Pasta is one of the easiest meals to make, but it's also one of the most versatile meals. You can make pasta with alfredo sauce, marinara sauce, or meat sauce. You can also mix things up by adding shrimp, veggies, Italian sausage, or chicken. The possibilities are endless! 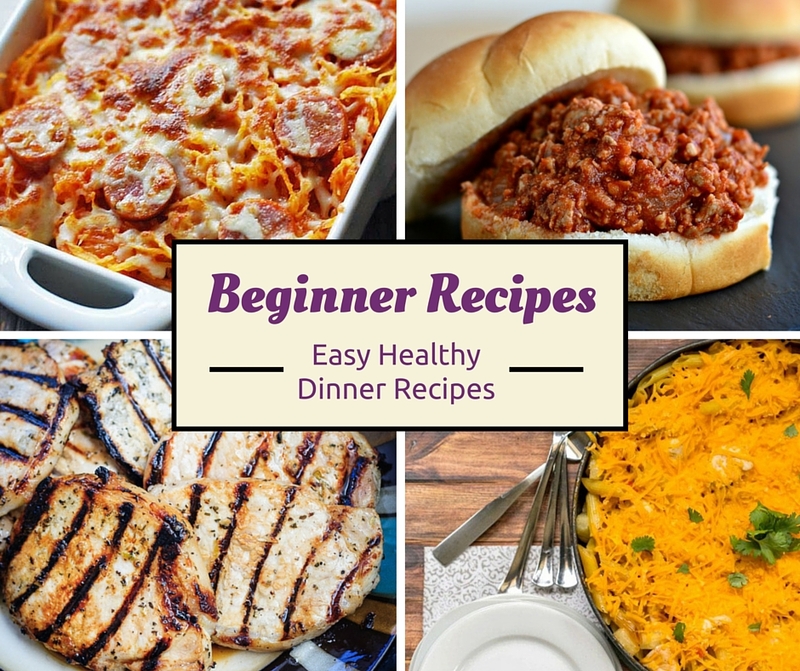 For even more beginner recipes, check out these 31 Easy Cooking Recipes for Beginners. Winner winner, chicken dinner! These easy chicken recipes will be sure to fill you up and leave you feeling satisfied. Don't get caught with the same chicken recipe night after night. Mix things up and try one of these easy beginner recipes! Although casseroles may seem a bit intimidating, these casserole recipes are some of the easiest recipes to make. You won't have to worry about timing everything perfectly because these can be a meal-in-one. We know that you'll fall in love with all of these Easy Casserole Recipes. We couldn't leave out these amazing beginner recipes. Between the pork chops, meatloaf, skillet pizza, and sloppy Joes, it'll be hard to decide which easy dinner recipe to try first. We recommend that you try them all! I'm going to use this collection as a guide to plan my meals next week!